Illinois Treasurer's Candidate Bob Grogan posted a cryptic piece on his Facebook Wall about his 'opponent' and his 'minion' sending around an email that had - what sounded like - accusations of Grogan falling asleep at the switch while being DuPage County Auditor. That had us wondering: what was in this scary email? After asking around and seeing this tweet, we've found it. 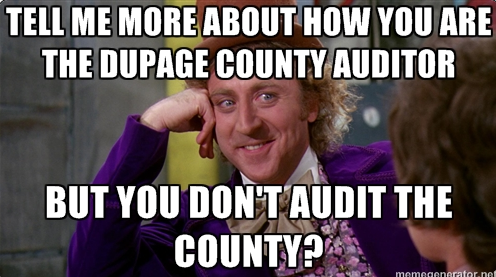 The story in the email can be found here: Only in Illinois: Why Someone Needs to Audit the DuPage County Auditor. It opens a whole host of new questions about Grogan. DuPage County Auditor Bob Grogan has served as county auditor through some of the most significant county-level financial scandals in Illinois history. Now he seeks a higher office—that of Illinois State Treasurer. If only his county auditor’s office had uncovered the scandals which burst forth into public view, this may have been a viable career option. However, as it turns out, outside entities- including the federal government—discovered the shenanigans while Auditor Grogan completed just over two dozen far less substantive audits. In a stunning display of misplaced priorities, the county office issued a reprimand for two workers paid overtime in a manner “not recommended” by the office and uncovered some questionable weatherization projects; during the same five year stretch, the feds uncovered millions in misappropriated funds throughout other county agencies. We still don't really have an answer from him on the first question: how, oh my, can the list of elected officials that have endorsed him so closely match up to the list of offices that he audits. But, now Joel Griffin tells us that Grogan - who so proudly calls himself a certified public auditor - was standing by while some of the largest scandals took place across DuPage County Government. All while he was serving as the County Auditor. Grogan's response: "Hey...it wasn't my fault. I don't audit them."